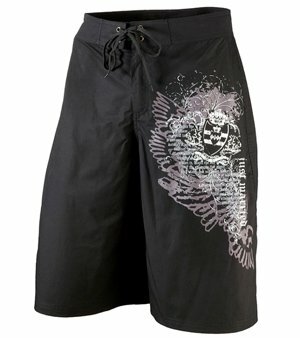 When the groom wants to show off his newly married status in style, he'll reach for these "Just Married" board shorts. These hip and modern trunks are ideal for surfing, swimming, and soaking up the sun. Black polyester means they'll dry quickly. Velcro closure and black lace ties at top. A handy right side pocket holds money, room key card, or ID safely. Artwork includes a subtle "Just Married" along the side. It's grunge cool and a fashionable way to celebrate a new marriage without being too flashy about it. Available in Large, Medium or Small. The small is a Men's 30, medium a Men's 34, and large a Men's 36.